Hannah Abbott Guthrie has been a widow for seven years, but for most of that time, she has still felt married. Caleb Guthrie was a part of her life long before they married. He was one of her brothers’ friends who often hung around the lively Abbott house, maybe the most irritating one of all. Then one day, everything changed: Hannah and Caleb fell in love. Life with Caleb was wonderful because Caleb, the center of a group of staunch friends he christened the Sultans, lived every minute fully. In a real sense, Hannah’s life stopped when she received the news that Caleb had been killed in Afghanistan. The love of her family, Caleb’s family, their friends, and perhaps most of all, Caleb’s dog Homer sustained her and allowed her to get through the days, one by one, but Hannah is not ready to let go of her life with Caleb and move on without him. Nolan Roberts is one of Caleb’s Sultans, and his grief over his friend’s death is deep and genuine. Seven years later, he still misses his buddy, and he sometimes wonders what Caleb would think if he knew Nolan had fallen in love with Hannah. Nolan is not exactly sure when it happened. He just realized at the Sultan’s annual Labor Day celebration that he not only admired Hannah’s courage and grace in living life without Caleb, but he loves her—enough to wait and see what might happen when Hannah is ready to move forward with her life. A few months before I Want to Hold Your Hand opens Nolan’s patience looks as if it’s going to be rewarded. Hannah dances with him at a local gathering and responds to a kiss (All You Need Is Love, Book 1), but Hannah quickly retreats. She can’t quite forget that kiss, however, and when another loss shows Hannah how much she relies on Nolan, she begins to realize that letting go is possible and that life and love still hold wonders for her. I loved the first book in Force’s Green Mountain series, and I expected to love this one too. But I wasn’t prepared to be sobbing twenty pages into the book. And that was just the first time my tears soaked the pages of this book. Despite its lachrymose quality, I Want to Hold Your Hand is not a depressing book. It is filled with tenderness, warmth, and love of many kinds. 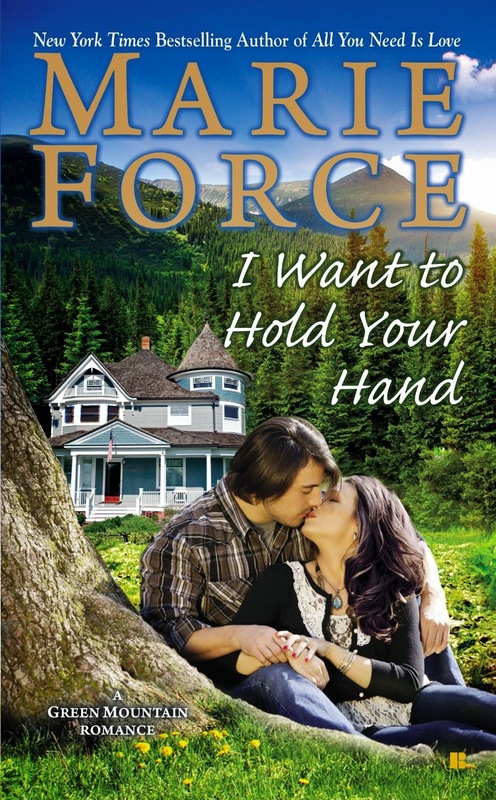 Force does a beautiful job of capturing the essence of Caleb Guthrie and the place he still holds in the hearts of his family and friends with the rightness of Hannah and Nolan’s relationship. Hannah is an endearing heroine, and it is easy for the reader to share Nolan’s admiration of her. Her conflict between clinging to an old love and embracing a new one is wrenching and real. It is tough to let go of the love of your life and maybe even tougher to give yourself permission to love again, knowing all that the heart risks when it is open to love. Hannah’s struggle is made more poignant because Caleb seems real to the reader, not just a shadowy memory. Force is adept at capturing the strength and complexity of family ties, and her ability to do so adds richness to this book. The multi-generational Abbott clan has quickly become one of my favorite fictional families, and Hannah’s in-laws add another layer of ideal family ties. Nolan’s far from perfect family kept it from being too good to be true. Readers who like the first book will be delighted to see that Cameron and Will have roles to play in this one as well. If you are a fan of small-town romance, if you like your romances rich in contexts of family and friends, or if you like romances that evoke both tears and smiles, I think you will love this book. For readers who missed the first book, I Want to Hold Your Hand can be read as a standalone, although I do recommend you also read the excellent All You Need Is Love. The third book in the series, I Saw Her Standing There, is the story of Colton Abbott and Lucy Mulvaney (Cameron’s friend from Book 1). A November 4 release, it promises to be as good as the first two. In the meantime, I’m listening to Beatles music trying to predict what titles Force will use for the remaining Abbott tales. What do you think of “All My Loving” or maybe “From Me to You”? I just won this book from Goodreads! I took All You Need is Love out from the library, so I can read them in order. Not sure if I am in a good place for sobbing, though! I guess you have to expect it, based on the subject matter. Glad you liked it. I will read this soon. Sounds good. Thanks for the review. Another series I'll need to read.